Black Walls’ new album Acedia is available for pre-release purchase. I’ve had Ken’s artwork on my wall as a huge print for the last couple of years. I’m stoked that this is now out. I’m a late adopter of Shazam, which is a semi-magic music recognition service. I just gave it a ten song shuffle from my collection. Reuben — Rafe Stefanini, which it thought was Sure The One You Need — Ron Wood. So: 50% hit rate, 50% miss — and one false positive. Adequate. So it knew about Withered Hand and Old Man Luedecke, but didn’t know about Marissa. About the same; maybe slightly better. It’s here on Spotify: MeFi Swap 2012-1. 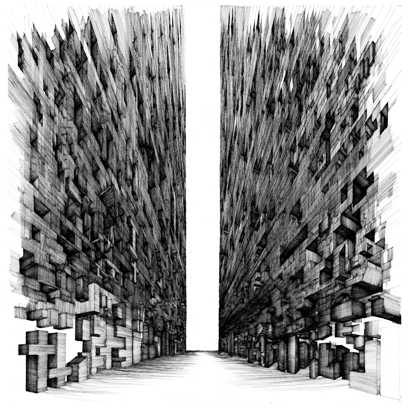 Bertrand Belin — Hypernuit: heard this on the radio. He has an awesome voice. Seeing as it’s all in French, I have no idea what it’s about, but that’s okay. Calvin, don’t Jump! — Under Bridges: Kirk Pleasant’s first major outing from his Canadian location. Combines E6 ambient and skronk with some thoughtful songwriting. Colleen and Paul — Colleen and Paul: happy, sunny, folky, lovely. Enjoy it before it becomes car ads. Dum Dum Girls — I Will Be: Motown meets The Jesus & Mary Chain, with screamy lofi fuzz. Like Strawberry Switchblade (DDG are big fans) with maximal noise. Entertainment For The Braindead — Roadkill: Julia did a banjo album! It’s great — and free! Frightened Rabbit — The Winter of Mixed Drinks: juddery Scottish gloriousness with full miserability ahead. Jónsi — Go: this album’s so sunny it farts marigolds. Peter Stampfel & Baby Gramps — Outertainment: dementedly demented, with demented bits gleefully stuck to it. Gramps sings like Popeye’s ancestor, and Peter’s got the caterwauling yawp down pat. They’re having so much fun making this, they don’t care what you think. The Ruby Suns — Fight Softly: don’t you dare call them Animal Collective Lite. They can dance better, for one thing. Stereo Total — Baby Ouh! : “irritating” is not usually a word one associates with a favourite album, but Stereo Total are completely annoying. I love them for it. Sufjan Stevens — The Age of Adz: this is a hard album to like. I was about to completely give up on it when I played it on a long subway ride home. I’m sold. Charming, but difficult. Brett Dennen — Brett Dennen (2005): he’s got a weird little voice in his first album, but Don’t Forget is as catchy as anything. Charlotte Gainsbourg — IRM (2009): it’s a Beck album! Not sung by Beck!! Kyle Creed — Liberty (1977): this is the clawhammer album. Kyle played such a clean banjo; e-v-e-r-y note’s in the right place, the volume’s right, he doesn’t dominate (bluegrass pickers, take note). So brilliant, and finally available on something other than cassette. Major Organ And The Adding Machine — Major Organ and the Adding Machine (re-release): squee! An expanded version of 2001’s mad outing complete with the movie. Spot all your favourite E6 musicians! Raymond Scott — Soothing Sounds For Baby (1963): The first volume (designated for one to six months) is about my level. I’d have been tripping spheroids if this had been playing near my crib. The Turtles — The Turtles Present The Battle of the Bands (1968): a delightful confection of phenomenal songwriting and playing making a very silly concept album. You’d hardly believe it was all done by one band. Stereo Total — Baby Ouh! Must be getting old; two of the albums (Bertrand Belin and Brett Dennen) I bought because I heard tracks on the radio. 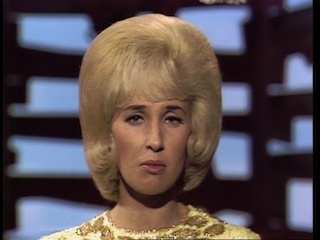 Consequently, I predict Lawrence Welk in my best of 2011. 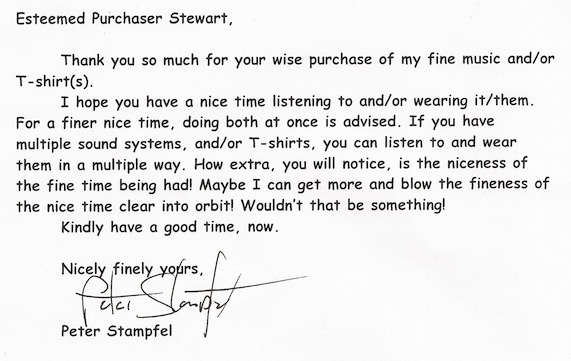 What with the sad loss of Wild East Compact Sounds this summer, my sources of music are now limited. eMusic, bless ’em, have been my source of indie stuff since about 2003. They were cheap, had a fixed price per download, and carried a raft of indie stuff and no major label tat. So, yeah, the full announcement: major label content, minimum 49¢/track, and variable pricing. Exactly all the reasons I wouldn’t want to use them. 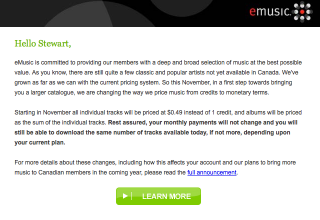 Good call, eMusic, for a battered-about subscriber since 2003. So basically they’re crediting me with a fake $4.48 a month (oh wait; “30 days”, not a month; they so want you to forget to download stuff by making the cycle date change) so I can still get my 35 downloads. Since they hint that there will now be variable pricing, I’ll bet the new stuff will be >49¢, so I really won’t be able to download as many per month after all. 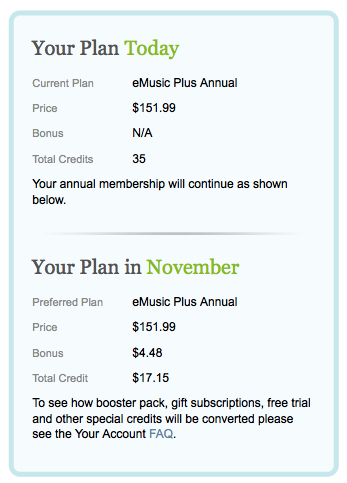 We’re also committed to making eMusic a better member experience. We recently rolled out improvements to Browse and Search pages. And we’re hard at work on a host of new features and enhancements including a music locker, which should allow you to stream your music collection from any desktop or mobile device. In addition, improvements to eMusic’s social features, to better connect you with our editors, other members, artists, labels and your friends, are also in the works. We’ve sketched out an ambitious slate, and it will take a little while to get there. We hope you’ll continue on the journey with us. I don’t want all that social fluff. The MP3s work just fine on any mobile device, so streaming them just adds more crud. I want fixed price downloads, not some half-assed music locker. Where, oh where is Frank Hecker and swindleeeee when you need them? Dr. Friendly Rich knows my name. I like this album a lot. Colleen and Paul have been working together for years (I saw ’em as Jack and Ginger in 2006), and this music needs to be heard! 5000 The Edison Museum They Might Be Giants No! Dook of the Beatniks is in the house!!! Whee! New album from everyone’s favourite musical genius/loony! More details at the Piety Street Studios Blog. 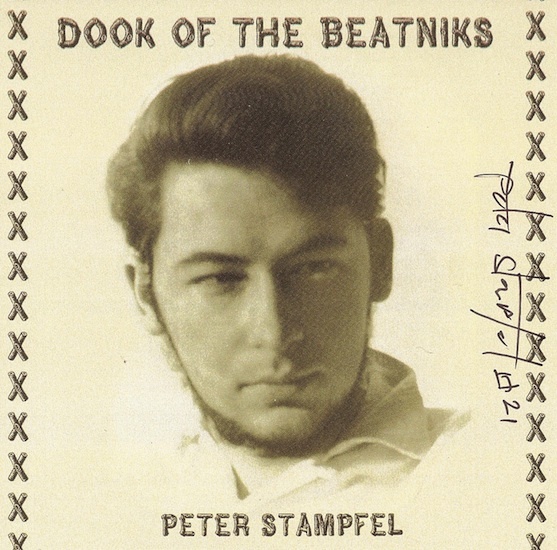 Author scrussPosted on 02010-01-19 Categories choonsTags music, peter_stampfel, yay1 Comment on Dook of the Beatniks is in the house!!! Spoils — Alasdair Roberts. Alasdair’s transformed from a good (if somewhat doleful) Scottish folkie to a full-on demented psych-folker with this record. The Wyrd Meme EP is nifty too. Banjo — Billy Faier. I know this album was recorded in the 1970s, but it’s as far away from tedious lick-based picking that most people link to the banjo. The fact that Billy’s giving it away free now doesn’t hurt, either. It’s kinda prog banjo, if you must. Old Dog — Chris Coole. Chris has been recording for more than a decade, but this is his first solo album. Fabulous songwriting (Old Dog, and The Bottle Got the Best of Me is sounds like something that Porter and Dolly should’ve sung), brilliant playing, and all this from a man who can smack himself inadvertantly on the nose with his own coffee grinder. Signal Morning — Circulatory System. Only five years late. Worth every minute. Clifton Hicks — Clifton Hicks. Zero production; just a guy singing along with his banjo. But both so well. Hypersomnia — entertainment for the braindead. Julia Kotowski makes achingly beautiful lo-fi noises. Sing the Greys — Frightened Rabbit. Visiting Scotland, and having a crappy job over the summer, made this my singalong-driving album of the year. The Midnight Organ Fight has a high nift-factor too. Yours Truly, The Commuter — Jason Lytle. Probably better than anything he did with Grandaddy. 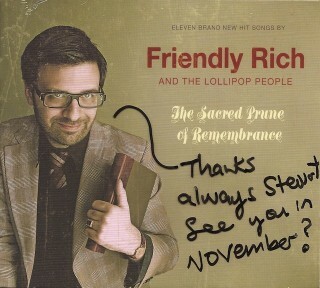 His free christmas album of piano music is pretty spiffy too. Lord Cut-Glass — Lord Cut-Glass. I didn’t get into the Delgados when they were around (silly me; there was some fine fine music in Scotland while I still lived there), but Alun Woodward belted out a classic this year. Bought on a whim (a small Scottish coin, or unicycle) at Monorail in Glasgow, it’s a favourite when stuck in traffic on the 401. Waxing Gibbous — Malcolm Middleton. Who knew that miserabilism was so much fun? Actually, it was Devil and the Angel from his first album that got me back into his work. Love It Love It — Nana Grizol. And I do love it; noisy punk from the friends of Elephant Six. Technically the new album Ruth comes out next year, but it’s out already if you’re not hung up on physical media. These Four Walls — We Were Promised Jetpacks. Scottish – yeah! Quite a bit of Scottish content in there, I know. I was probably supposed to like Goodnight Oslo by Robyn Hitchcock & The Venus 3 more than I do, but there was so much music this year it kind of got buried. My sister (Wendy Arrowsmith) has a new album out, Seeds of Fools. Dunno what Friendly Rich was thinking releasing Pictures at an Exhibition so late in the year. It’s a twisted jazz take on Mussorgsky, and nothing to be modest about. Peter Stampfel on freak folk origins. So I was at The Dakota Tavern last night, expecting to see nana grizol with Colleen and Paul. I got there far too early, and notice that there was no sign of Theo Hilton or the rest of the band. I learned from Colleen (whom I’d met before) that they’d been stopped at the border, so Colleen and Paul were playing a longer set, and Colleen’s partner Ron Sexsmith would play later. Immigration for musicians annoys me. The costs of visas, and the processing time required, basically means that most bands I’d want to see risk getting turned away at the border. Since touring is how these bands make their living, everybody loses. Still, Colleen and Paul – assisted by a couple of Colleen’s friends – ended their set with a lovely version of Jeff Mangum’s arrangement of I Love How You Love Me [mp3, lo-fi phone recording]. When I first heard of Alvin Lucier‘s “I Am Sitting in a Room” I thought it would be interesting to attempt a recreation with the tools I had on hand. 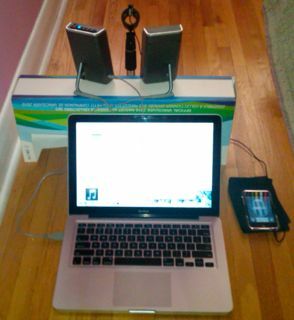 Rather than shuffling tapes around, I recorded on my iPod Touch, and then e-mailed the file to my laptop to play back. I repeated this sixteen times. This is what I ended up with: my name is not alvin [mp3]. I’m pretty sure all I ended up recording was the hard drive and the backlight on my MacBook. By the final iteration, the cricket-like chirping is centred pretty close to 5400 and 16000 Hz. 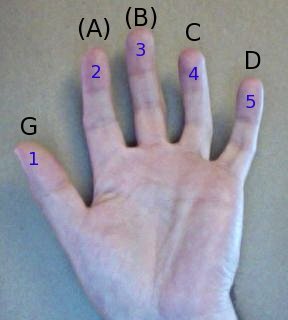 Yeah, that’s my right hand. 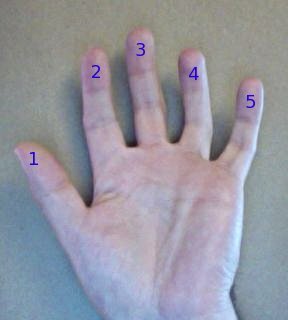 Spare me the tree-frog comments, but note how I’ve carefully numbered the fingers. For some reason (look up chord theory, or chord progressions) the 1, 4 and 5 chords sound good together. Some people write ’em as I, IV and V if they’re feeling all fancy and classical like. So to play those nice sounding 1-4-5 chords in A, you need to know A, D and E (or E7, if you’re feeling folky). In this case, the D pretty much has to be the real finger-stretching D chord (hard for us tree-frogs) or it’ll sound naff. If you’re singing along to your old Pete Seeger 78s, yer traditional folk/gospel/church songs are in C. Hand to the rescue! 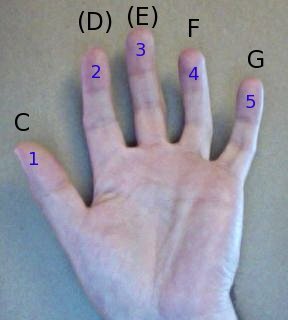 So, for the key of C, you need the chords C, F and G (or G7). F is a nightmare on a guitar, easier on a banjo, easiest of all on an autoharp. You guessed it – D, G and A (or A7). That’s how Chris Coole taught me it. It’s a bit of a simplification, but it works for me.